Lizards are the largest group of reptiles with around 5,000 species known to exist. They have also been found on every continent except for Antarctica. Lizards eat many different things in the wild, and diets vary depending on species and environment. Since lizards can live in deserts, wetlands, forests or on plains, what they eat often depends on what is available. Many different species of lizard feed on insects in the wild. The type of insects varies by location. 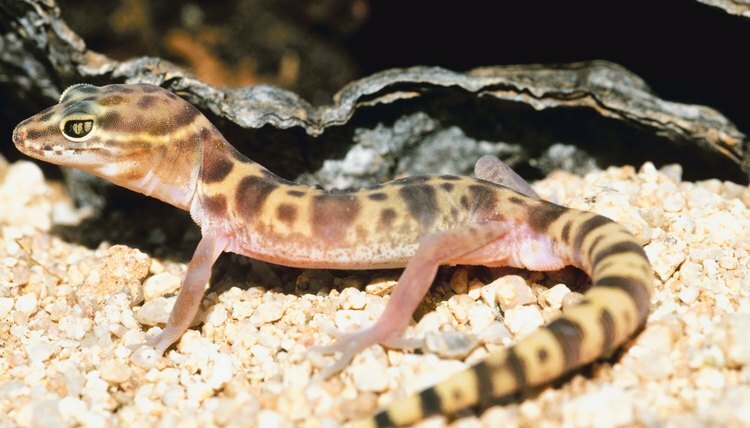 Crickets, flies, worms, grasshoppers, ants, spiders and cockroaches are very common foods for lizards, including geckos, because they are so abundant in the wild. Small lizards including skinks and fence lizards are considered valuable around homes because they eat termites and other insects that cause damage. Some insects -- lightning bugs, for example -- are actually poisonous to some lizards. It is not uncommon for lizards to steal mammal eggs from the nests of other animals. Eggs are easy to capture and do not require much effort for lizards to steal. The type of eggs they steal depends on the species of animals that lay eggs in their habitat. Gila monsters are an example of a species of lizard that steals eggs for food. Some species of lizards feed on other lizards, including their own species. Collared lizards are a species of lizard that will eat other lizards as a main part of their diet in the wild. Lizards that eat other lizards also often eat insects and other forms of meat. Mice, small birds, small snakes and easily caught rodents often fall prey to lizards. Some lizards such as green iguanas do not eat meat but are strictly herbivores. Other lizards will eat insects and other forms of meat, but will also supplement their diet with plants. For example, in the wild, green iguanas eat flowers, leaves, soft fruits and young plant shoots. Does a Lizard Have Poison?